Love, enthusiasm and passion in all that she does. That is a good description of the "secret" of Monica's success. Serving people is something she truly enjoys and listening carefully to each of her client's needs, getting to know them and understanding what is most important motivates her to turn their real estate goals into reality. Her highly skilled level of "Hand Holding" you throughout the process. Whether buying, selling, relocation or leasing, it is her goal to make real estate transactions flow as smoothly as possible. She enjoys helping people achieve their dreams and welcomes the opportunity to be of service to you. Monica's real estate career is complemented by an extensive background in developing, marketing, graphic design, operations and management. Accompanied with 20 years of design and construction knowledge she has acquired working with her husband, John Nash, who has created and managed world class architectural projects throughout Southern California, including the extraordinary Del Mar Plaza. Her experience has made her extremely organized and technologically savvy. She is an expert in social media and is constantly educating herself to keep up to date with trends and cutting-edge tools in order to effectively market your home and insure it has the furthest reach. Most importantly, Monica is driven by the relationships she has with her clients. Their needs are her first and top priority and she prides herself in being open and available to answer questions. She operates with a high degree of professionalism and honesty to give them give them a smooth and positive experience. Additionally, Monica has a background in leadership with numerous philanthropic, educational, and community organizations, thus creating an ability to connect with people and build meaningful, trust-based relationships. Active in the community she serves and loves, Monica supports the San Diego Center for Children, and is the creator/organizer of the annual Santa visit and "Light Up a Life" event every December at Del Mar Plaza for fundraising and gifts for underprivileged children. She also is an ongoing donor to Giveback Homes, a community of real estate professionals committed to creating social change by helping build homes for deserving families around the world. 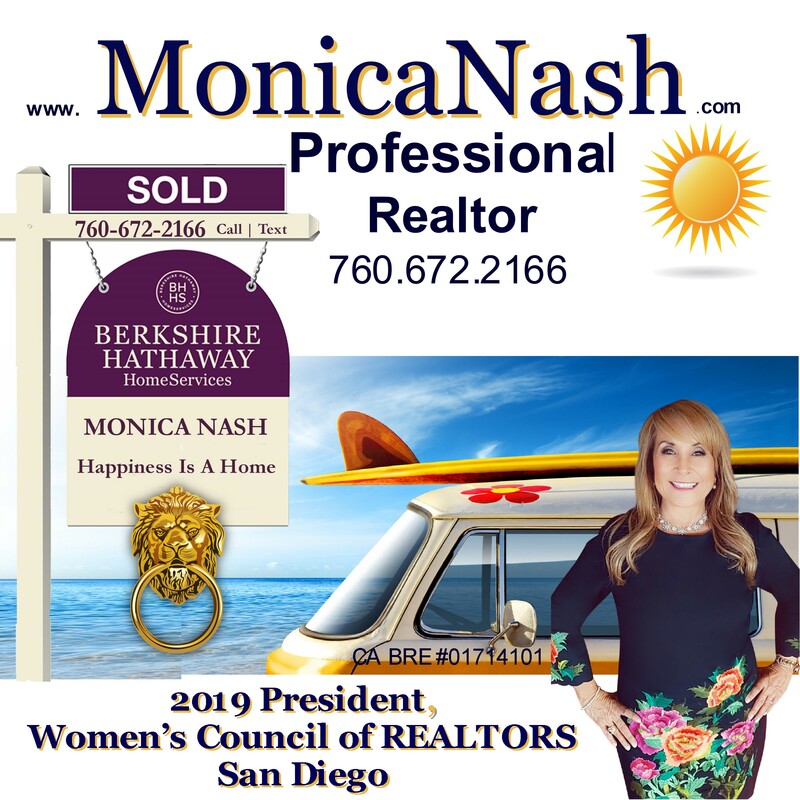 Thanks to Monica's superior real estate knowledge, willingness to help clients and colleagues alike, amazing positive attitude and outstanding relationship skills, she has received the 2016 REALTOR® of the Year Award from the Woman's Council of REALTORS® She is one of Berkshire Hathaway's 50 Top Producing agents San Diego County Agents for 2018 transactions. 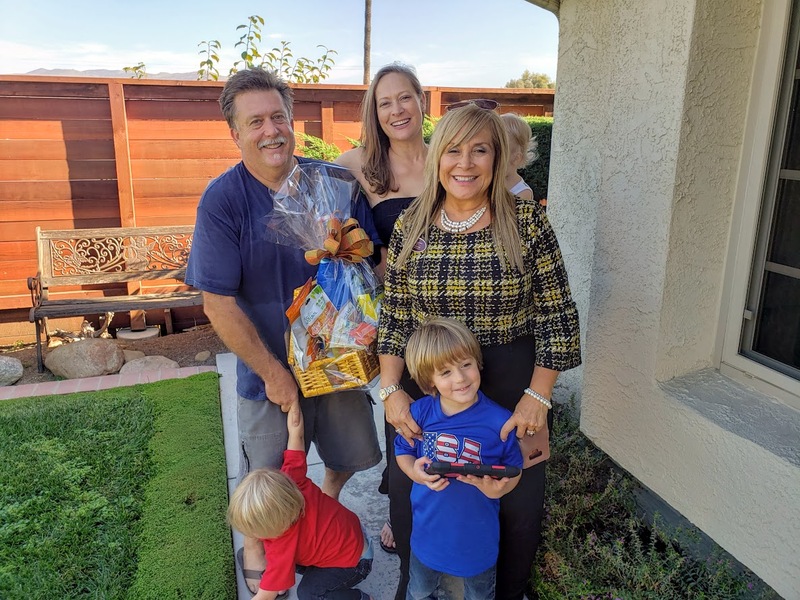 Monica's passion for delivering great results for buyers and sellers has additionally earned her numerous sales and production awards from Berkshire Hathaway HomeServices California Properties. You can count on honesty and a strong work ethic when we partner for buying or selling your property. It is important for you to know that I will be available to you and will make sure you are comfortable every step of the way. If you are a buyer I will work with you to find the perfect house or investment property, incorporating your requirements and wants with my market knowledge and experience. When you list your home with me you will have a large local sales force behind you as I work hard to keep your property at the forefront of every local Realtor's mind. With the Berkshire Hathaway name and network of relocation specialists, your property will be viewed by buyers from all over. I am prepared to move at your pace whether you are just starting to consider a change or if you need to move quickly! Call me now so I can get started working with you right away!!! Are you a first time buyer looking for honest guidance and expert negotiation? make this huge step as stress-free as possible. At our initial consultation I will walk you through the home buying process so there are no surprises along the way. I will provide recommendations for you to work with the top mortgage lenders, title companies, home inspectors and attorneys in the business. make You stand out from the crowd. A prepared buyer is a confident buyer! After owning our home for 20 years, making a decision to sell and move to another state did not come easy. Having a realtor who is compassionate, enthusiastic, positive, and professional made a huge difference in our success. While other homes in our neighborhood were sitting for months without offers, our home was getting all the attention, and it was only due to Monica’s technology and marketing skills. There is no other realtor like Monica, she is always on top of every step, she thinks 10 steps ahead, and handles all the stress of buying and selling a home with the utmost professionalism. We are so thankful for Monica’s personal expertise and her tenacity to be the best at what she does. I sought out Monica based on the number of homes that I saw she was selling in my complex. During my initial meeting with Monica I was super impressed with her professionalism, knowledge, and the manner in which she made me feel as if I was her ONLY client! Monica held an open house for me the following weekend and within 24 hours of my open house she called to tell me that we had an offer! Not only did Monica assist me in selling my home, she was able the agent I used to purchase my new home. Throughout the whole house selling/buying process, Monica was uber proactive in anticipating my never ending questions and responding to all of my inquiries in lightening speed! I would gladly use Monica again in the future and have already recommended her within my circle of friends. Monica is a consummate professional and she stands out from any other realtor I have ever known. Monica is extremely helpful in the purchasing process, anytime there was an issue she was on the phone or running down paperwork to ensure that things went smoothly and quickly. Monica works with the most professional ethics of anyone in the business, I can't imagine wanting to have anyone but her as my realtor, hands down. All of my expectations were met along with a few that were not expected. Monica had solutions for all of my concerns. I've used other "professional" realtors in the past and Monica outshines those three others by far. She treated my home as if it were worth $1,000,000. Monica utilizes all of the current technologies and it is immediately obvious that she has tons of experience. I will use her service when I sell my current home and I will recommend her to all those in need. Monica is not just a wonderful realtor, she is also a wonderful person. Monica Nash is a true professional. She loves what she does and it shows. Not only did she find us the home of our dreams, but she really helped getting our buyers loan financed! She is an educated, enthusiastic and a perfectionist when it comes to buying/selling a home. She walked us through every single step and explained every docusign in length. I will never buy or sell my home again without Monica! My interaction with Monica was a pleasing experience. Her personal attention to detail not just the paper process but mostly the keeping me in the loop on a daily basis. Follow through, knowledge of the area and her calming influence as to my personal stress were just a few attributes that made me glad I had her help. If ever I had an opportunity to recommend Monica I would do so without fail. After living in our home in Orange County, Ca for over 20 years my husband and I were ready to sell and retire to San Diego County, Ca. I kept noticing signs popping up in our area for Monica Nash, Realtor. The best thing we ever did was contact Monica Nash to sell our home! Not only did Monica Nash come to our home to consult with us, do a walk through, point out the few minor changes that would sell our home, but she actually set the date for our first Open House the first day we met with her and got us well above what we imagined we would get for our home within minutes of the very first Open House we had! She is an expert at social media and had our home listed everywhere with all of the top real estate search engines right away! We received offers even after our home went in to escrow! We could not have been happier to have such a fantastic Real Estate Agent! She held our hand through the whole process of selling our home and has gone above and beyond to support my husband and I in the process of searching for our new home! From start to finish she was available for us every step of the way, morning, noon and night! Honest, reliable, friendly, professional, very hard working and extremely diligent. Our Real Estate Agent Monica Nash Is Truly A Star! My name is Jorge and I have been wasting my money on rent for the past 7 years. Today, I can say that I am a HOMEOWNER THANKS TO MONICA NASH!!! It is the best investment that I have made up to this day. The community we chose is MAGNIFICENT. It contains GREAT schools and is a tranquil area. My kids will definitely thank me later for moving them into the neighborhood. None of this could have been done without the effort and expertise of Monica Nash. Monica is GREAT at what she does. She is well aware of the "ins" and"outs" of home buying. If you are thinking of buying a home in the near future go with MONICA NASH!!! Monica is a wonderful agent to have on your side. She's professional in every sense of the word. I was blessed to have her help me on the purchase of my very 1st home. Not only was she my agent,I'm now blessed to call her friend. You can't go wrong with Monica on your side. She's truly a wonderful lady that will help you every step of the way. I highly recommend her. She made my dream of homeownership come true and I will forever be thankful. My experience with Monica Nash was without a doubt oneness of the most pleasant experiences I have ever had. She was knowledgeable. She helped the process go very smoothly. Based on information from California Regional Multiple Listing Service, Inc. as of 04/23/2019 05:41 AM. This information is for your personal, non-commercial use and may not be used for any purpose other than to identify prospective properties you may be interested in purchasing. Display of MLS data is usually deemed reliable but is NOT guaranteed accurate by the MLS. Buyers are responsible for verifying the accuracy of all information and should investigate the data themselves or retain appropriate professionals. Information from sources other than the Listing Agent may have been included in the MLS data. Unless otherwise specified in writing, Berkshire Hathaway HomeService has not and will not verify any information obtained from other sources. The Broker/Agent providing the information contained herein may or may not have been the Listing and/or Selling Agent.